It’s the clever young man who writes a column for another newspaper who made me realise for the first time what’s really wrong. He was so clear and trés articulate that it hurt, like a bright stab of sunshine hurts one’s vision after the dark clouds have parted part fleetingly. Tellingly, he isn’t alone these days. There’s an increasing number of Sri Lankans who not only feel the same, but are increasingly beginning to express their opinions. Middle-class, middle-brow, middle-of-the-road. With their patient semi-indulgence of a good idea gone wrong and going from bad to worse without any immediate prospect of redemption, they’re utterly frustrated with politicians once deemed worthy – who, now, look like they wouldn’t get it if ‘it’ was handed to them in a brown-paper parcel marked “it”. They’re clever young men who write insightful columns, discerning readers who nod in distant and frustrated agreement, educated but angry young men and women on the streets at protests and behind barricades being water-cannoned by the conservative government’s stopper-coppers, erudite members of the academic and professional communities sipping tea or something stronger and nodding in profound sympathy, grannies in their gardens, commuters clinging for dear life on mackerel-thronged suburban trains, the man in the street, the girl behind the checkout counter, the old uncle selling sweets and toys outside school. They’re you, and but for the grace of Good Government they’re me. With few exceptions these days, many of them seem to be saying the same thing: “All I want is my country back.” “Give us our old country back.” Because the new one we all dreamed about and hoped would become a fabulous reality, to which we could awake after the bloodless revolution was done, has evaporated into thin air in less than a year and a half. In these trying days, which are at the same time rife with temptation for the people to revoke their faith in governments of principle, and replete with trials for governments caught between high ideals and values and the low need to survive up to the next election, we might do well to ask what we – well, almost all of us reading this, at least – want to get back to. For starters back to the big ideas in the original 100-day plan, many of which we’ve all but forgotten and some of which are dusted and on the shelf with an expiry date on it ticking away like an unexploded time bomb. Then back to the dream (if you’re an idealist or high-minded republican or something unrealistic like that) or back to the drudgery (if you’re a hardworking democrat who doesn’t shy away from a bit of hard work on behalf of your electorate) of transforming our island nation from a post-war country into a post-conflict state to be proud of and live in with peace and justice for all. Back to walks in beautiful parks but knowing that less privileged folks living a stone’s throw away aren’t prone to be literally swept off their feet by tide and flood waters while despicable opportunists swing by in their brand-new super-luxury duty-free taxpayer-draining chariots of comfort to shed a crocodile tear or three before returning to their swank palaces with silken girls bringing sherbet. Back to self-sufficiency in rice and fish, not bent over backwards brokering treaties to benefit our hungry mouths with the largesse of noble strangers while plenty and prosperity lie neglected in our backyard because of bureaucracy or the culpability of politico-backed businesspeople on the lookout for a quick buck. Back to integrity as a sovereign nation-state and more than a modicum of self-respect, not having to make do and the whims of the west or the fancies of the east, while mending fences and smiling bravely and biting our lip as we hold out the begging bowl to all and sundry and true patriots suffer in silence and patronising foreigners dictate terms to us with a smidgen of pity evident in their handouts. Maybe we don’t all know what ‘getting our country back’ means, or could get us into. While to say that the more things change the more they remain the same is a trite cliché that I’ve got to stop using, it’s no less a truism that things COULD be worse – in fact, once upon a time, it WAS worse; MUCH worse. So lest we grow maudlin about the way things were and start sentimentally sniffing about a glory that we think has passed, let me set the record straight. This cry from the heart or lament over the lost opportunity for greatness that we had – and still have – is not a call to rally round the flag of any of the previous regime’s standard-bearers. Rather it’s a clarion to the banner of a new republic in which we get the ‘old country’ back without getting the ‘old corruption’ back. So here’s to getting back the ‘new country’ that never was, but yet may come into being under a ‘new dispensation’. It’s about asking tough questions from a grand political movement gone wrong, because government seems to have forgotten that it was the people’s vision as much as the ambition of grasping or overreaching politicos that established a beachhead for a new republic. It’s a dream embedded in the national psyche that has become disembodied from the body politic by dint of realpolitik. It’s a visionary virtue to be able to envision something that is not in the present, by pretending that it was in the past, in order to return to it in the future. It’s inhaling the aromatic vapours of the best of those blends from our own ‘Little England’ tea-as-a-drug, also known as nostalgia. It’s imbibing the cold crumbly jaggery-coloured sweet-meat from a wayside ‘boutique’ or tea-kiosk, which we call bibikkan – the closest thing Sri Lankans have to cake. It’s our parents’ and grandparents’ infinitely regressing fond belief that everything was better back then… that Ceylon (Lanka, really) is a worse place now than it was at some half-remembered but well-loved time in the past where we had achieved the status of a civilisation. It’s the suspicion that the best of us (Ceylonese leaders, Sri Lankans heroes) have been and gone; that nothing new we could do ever can build something as grand as the Sea of Parakrama, that no art will be as good as the frescoes atop Sigiriya, no poem as alluring as Walter Stanley Senior’s #Hymn to Sri Lanka, no soldier a hero greater that Kobbekaduwa, no statesman a shade of the quintessential king of diplomacy Kadirgamar, no sportsman a touch on kingly diplomat Kumar Sangakkara. Until the new deal becomes a reality in the near future! Unless the present realpolitik becomes a thing of the past! Utterly useless, then, if our immortal longings for a better state of affairs aren’t instrumental in translating the people’s vision into a realisable waking dream through the agency of our politicians’ will to survive. Desiring to have a ‘new country’ (read: a radically people-oriented ‘new constitution’ or equitable ‘new political culture’ or even simply a just and fair ‘new deal’) is the mantra of too many people from too many different walks of life for government to continue ignoring it as constantly as they have been doing. We have to all act collectively now to draw our beloved country back from the brink, back from the future, back to an idealised past, back to present safety. And reasonable roads if not absurdly expensive expressways; country lanes to connect villages and farm produce with ports and treasure on ships at sea through exports; temple and church bells and kovil smells and muezzins’ cries all calling the faithful to a closer walk, as we once did together; fresh water not bottled from sources close to the spring and children playing hopscotch and football in every hamlet’s playing field and ‘french’ cricket down neighbourhood avenues and cheery banter as homeowners line the lane to see the world go by. Problem is, nostalgia isn’t what it used to be. I mean that only half ironically. The dream of that young man who dreams dreams and the visions of the old men who envision the future isn’t that we might be able to make a better, brighter, newer, more equitable tomorrow for all our sons and daughters. It’s a pseudo-democratic desire to lapse back into a semi-authoritarian anti-populist inward-looking yesterday in which we could rage against a man and a machine. In our insular post-revolution fantasy, the best we seem to be able to hope for is a modicum of transparency and accountability in this as usual, as always, self-congratulatory island-paradise where incumbents are saviours and political messiahs of the past are pariahs. The response from the rebellious – both young political commentators and suspicious old journalists like yours truly – is as naïve as it is necessary. All we need, our argument goes, is to be free of the restricting shackles of an alliance we never asked for and rid of the spoilsport whiplashes of the joint opposition and their collective progressive apathy as regards political reality and republican potential to self-actualise alike. 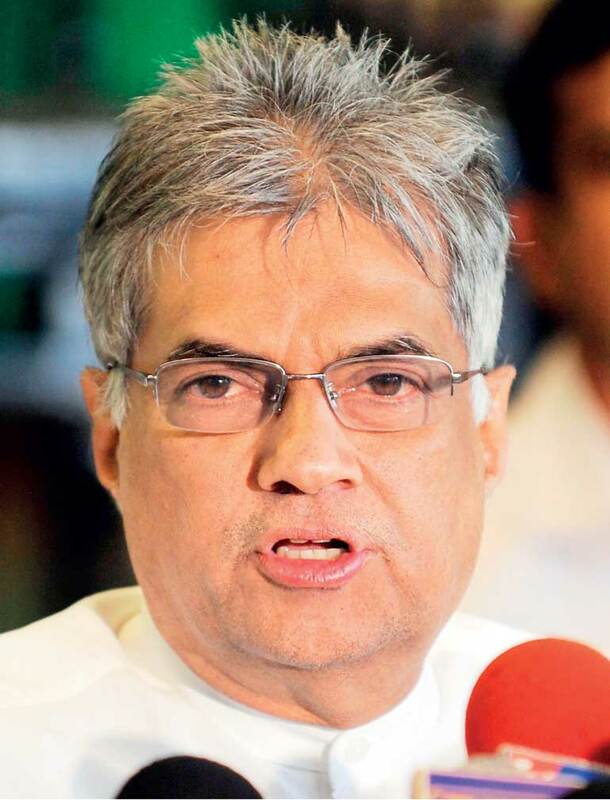 There is a hint that we’re (that is, the UNP is) willing to muddle through this mess if it will get us back to business as usual (‘ten percent off the top’ and ‘jobs for our boys only’ and ‘let’s not rock the boat’ because ‘there’s plenty for everyone’ as long as you ‘play the game’). There is a hope that we’re (that is, the UNFFGG is) able to look forward to what the nation asked for (a ‘new deal’ for us the people) or what we evidently thought it asked for (a ‘new deal’ for us your politicos) – now conveniently packaged as what is good for all of us (a new political culture that looks suspiciously like the old and a new constitution that will selectively cement the careers of an elite few). There is a concomitant hope that if we manage to back out of the ties that bind us to Good Government, then we’ll get back to that pig-headed, iron-fisted, he’s a jolly good fellow sort of soft dictatorship of this new elite. Some would argue that that dream has already actualised for the stubborn part of a stubborn party leadership in power that stubbornly refuses to explain its will in some areas and apparent lack of political will in others to the people who elected it. The irony is that the angry young men who championed the principles of Good Government and campaigned for the parties that are now in power are the very dreamers and visionaries who carp and cavil the loudest that the vision has failed and the dream has died… It is not because nothing is happening, but rather because there is little reason and less rationalising done to explain, excuse, or justify what is being done, indeed, in the very name of Good Government by a government that is increasingly good only in name, if even in that. GG has let its own side down; its boys are baying for its blood. Thus there is a valid reason why most angry young people who want to challenge the appalling apathy of Good Government are young, while those who know it well enough to leave it alone are old. It’s because the young aren’t infected with a Ceylonese nostalgia. They don’t recognise that the beauty of lovely island nations remains unchanged and perhaps unrealised in the idealised past, while the beast of human nature remains unchallenged but self-actualised in the present. They’ve grown up under a regime arguably more repellent than the worst authoritarian regimes of recent South (and South East) Asian history, so Good Government at its worst cannot be neutral for them as it is for those of us who see realpolitik for what it was and ever shall be, world without end. So, dears, I do suspect that asking for a rational and sensitively engaged rationale for their policies or lack thereof of Good Government is a begging of the question a bit too far. It is like demanding accountability and transparency of the regime just past, and good riddance to it. There are administrations which promise the sun, moon, and stars; but remain just a tad elusive about the full monty when it comes to stuff like RTI, culpability and punishment for alleged financial crimes by foes and friends alike, or whether we are in a ménage à trois (no, a cinq!) with India, China, and the Western powers. For now, we listen to our powers that be talk a lot about the trade deals they’re going to make with the UK post ‘Brexit’, and the blithe insouciance which they’ll simultaneously offer the EU in terms of our desire to do business with Asia. That’s realpolitik on a global scale, and we’re grateful government is good at gamesmanship with the Western powers. But as much as the writing is on the wall for ‘Little England’ vis-à-vis the will and power of Scotland and Northern Ireland post the popular but ignominious exit, a little island republic will also have to struggle – sans a referendum, save for the little matter of the future constitution – where our affections (and affectations) lie as regards our long-term relationships with India and China. As to whether a divorce is on the cards, or it is détente that is intended, we can’t tell. It’s tight-lipped triumphalism combined with duplicitous diplomacy. And who’s to gainsay that that’s the way to go?